How can I possibly not go somewhere where they serve something called the Charleston nasty biscuit? It is a piece of fried chicken and cheddar cheese sandwiched between a big fluffy biscuit drenched in sausage gravy. Hominy Grill has been featured on plenty of food TV shows – people rave about the shrimp and grits and, of course, the famous biscuit. To be honest, after two days of vacation eating, I was getting kind of full, so I was happy I was able to convince Wendy to share the biscuit ($9.5) with me – that and a side of grits ($3) completed our breakfast. 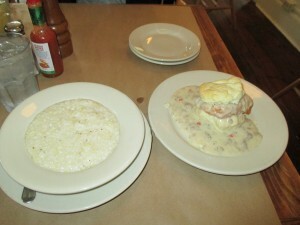 The grits were good - creamy and cheesy, but nowhere comparable to Husk’s grits from the previous night. Everyone enjoyed their breakfast. The prices were affordable and the service was friendly. Definitely make Hominy Grill a stop if you are in town. Monday's weather was sunny and 70 degrees – a nice charge from the cold rain. So we decided to take a drive to Folly Island, one of Charlston's outer beach islands. 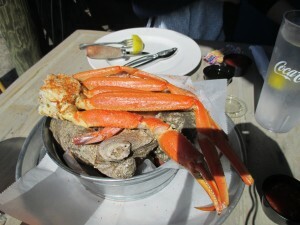 We had lunch al fresco at the Crab Shack and Wendy and I shared a Charleston steamer basket ($30). It had snow crab, oysters, shrimp, potatoes and corn, simply steamed and seasoned. I've never shucked oysters before, so this was an adventure in eating. I'm pleased to report I managed not to stab myself with the knife, but it took a long time to find the sweet spot on each of the oysters. I think from now on I'll let someone else do the shucking for me. 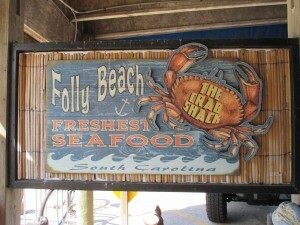 The seafood was tender and flavorful; there’s nothing I like more than eating seafood in the sunshine. Most of the girls left on Monday, so by the evening there was only Allison and I left. 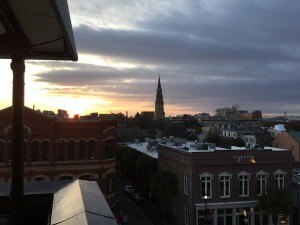 We decide to go to the Vendue, one of the city’s famous rooftop bars. The view was lovely - you could see the sun setting over the buildings in the horizon. It started getting chilly so then we move to the brewery across the street. Drinking on an empty stomach is never good plan for me so I had an order of onion hush puppies ($3.5). They were crispy and a perfect bar snack. I sincerely thought we were done eating (and drinking), but by 9pm, we couldn’t resist the siren song of BBQ just around the corner. 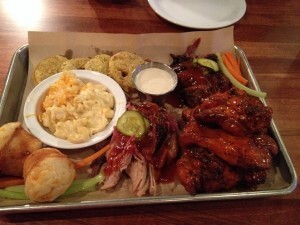 We shared a combo plate of pulled pork, Buffalo wings and beef brisket. 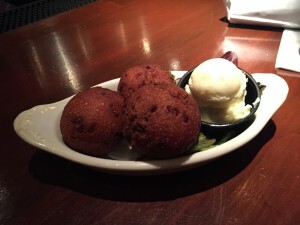 It came 2 sides – we opted for mac & cheese and fried green tomatoes, as well as 2 cheese biscuits. The brisket was the best, tender and a decent amount of fat. The pulled pork should have been smokier and the wings were perfunctory. I enjoyed the mac & cheese more than the tomatoes, which needed salt. I was offended by the “biscuits” which were more mini-muffins than biscuits.